INTERMITTENT is an audio-visual non-loop installation. The video and sound material is controlled by a dynamical system in the background.. The motion pattern of this particular dynamics is called Intermittency, a technical term from the field of nonlinear dynamics research. Intermittency means “in between” or “interruption”. The movement changes between periodic rhythms and irregular oscillations. In INTERMITTENT this genuine musical structure between regularity and improvisation is turned into a generative art installation and situates itself beyond classical video loops or aleatoric video editing. 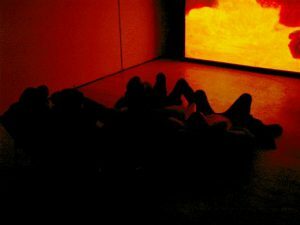 Even the acoustic and visual material lives in the same area of conflict and evokes associations to the complementary elements of fire and water. According to Gaston Bachelard, they stand for different notions such as frictionless continuity and sudden changes. Regularity versus ruptures, repetition versus singularity, they exist only as mutual contrasts. In this installation they are present, though their apparent contradictions are lifted.